In a 2019 Ford F-150 SuperCrew tested, the dummy's position in relation to the door frame and dashboard after the crash test indicates that the passenger's survival space was maintained well. The Ford F-150 is the only pickup to earn top ratings in passenger-side crash testing by the Insurance Institute for Highway Safety. The IIHS on Thursday said all four of General Motors' pickup nameplates earned only "marginal" ratings, while the Toyota Tundra was the only one of 11 crew-cab pickups tested to get a "poor" rating. GM's pickups and the Tundra received "poor" ratings for how the vehicle's structure held up in the passenger-side small overlap test, which IIHS initiated in 2017. All 11 pickups tested earned "good" ratings for head, neck and chest injuries. The Tundra was the only one not to receive a "good" rating for hip and thigh injuries. The Ram 1500 and Nissan Titan joined the F-150 in receiving "good" ratings overall for passenger-side safety, though they landed one notch below the F-150 for structural integrity. The results contrast with top ratings for nine of the 11 pickups on driver-side testing conducted previously. The Honda Ridgeline, despite trailing the top performers with an "acceptable" overall passenger-side rating, is the only pickup to qualify for a 2019 Top Safety Pick award. That's because the Ridgeline is the only one to also get the required ratings of "good" for headlights and "superior" for front crash prevention. 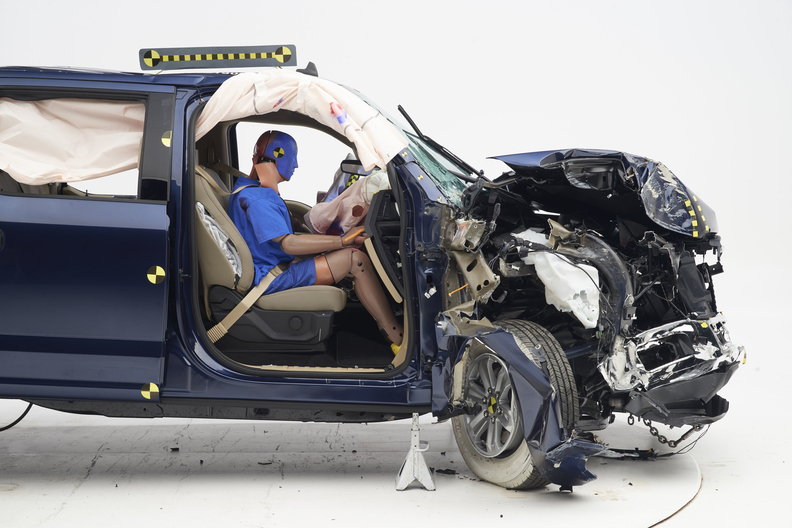 "We commend Ford, Nissan and Ram for providing state-of-the-art crash protection for both drivers and front passengers of their large pickup models," David Zuby, IIHS chief research officer, said in a statement. "As a group, however, the pickup class still has a lot of work to do." Small-overlap crashes account for about 25 percent of the serious driver injuries and deaths that occur in frontal impacts, IIHS says. The test, introduced in 2012, involves 25 percent of a vehicle's front end on the driver side striking a 5-foot-tall barrier at 40 mph. IIHS added a passenger-side small-overlap crash test in 2017. General Motors: "We are focused on the safety, occupant and restraint performance of our pickups. GM designs our vehicles to protect the occupants in a broad range of crashes including front, offset, angle, side and rear impacts. Our designs are tailored to meet the specific product needs and to ensure performance for our customers. As part of our commitment to safety, we continue our efforts to develop and implement safety improvements in all our products." Ford Motor Co.: "A cross-functional group of Ford truck veterans worked thousands of hours to help improve durability, capability, fuel economy and safety for F-150. The team created 31 safety-related innovations -- including structures that manage crash forces, plus joining methods that were tested virtually with computer simulations then retested in Ford’s advanced laboratories. "To manage crash forces in the Insurance Institute for Highway Safety small overlap front crash test, Ford created a system of innovations that work together to help achieve this result. These include a patented extruded aluminum roof crossmember and additional frame crossmember that work to improve crash resilience. Other smart innovations include nylon hinge pillar reinforcements that save weight, and in conjunction with specially designed wheel blockers, work to control crash forces while also providing additional safety." Nissan Motor Co.: "Nissan is committed to the safety and security of our customers and their passengers. Regarding the Insurance Institute for Highway Safety’s (IIHS) crash test ratings for the 2019 Frontier in the ‘small overlap front crash test,’ Nissan will review the test results along with other test criteria to determine if there are opportunities for improvement." Vehicles are given "good," "acceptable," "marginal" or "poor" ratings. Many automakers initially struggled with the driver-side tests but have increasingly added features to improve their performance. Ford in 2015, for example, added steel horns -- known by most engineers as wheel blockers -- onto the frame of some F-150 versions to redirect the energy of the collision away from the passenger cabin. The automaker later spread the wheel blockers across all F-150s. For the redesigned 2019 Ram 1500, Fiat Chrysler Automobiles incorporated what it calls a "splayed" frame, spreading the leading elements of the frame outward on each side of the pickup -- and protecting the wheel in the process. IIHS said the Tundra's dummy received the most damage during testing, indicating a right lower leg injury would be likely in the event of a real-world crash. Right hip injuries also would be possible. Maximum intrusion into the Tundra's structure was 15 inches, vs. only 5 inches for the F-150. The dummy in the F-150, by comparison, showed no signs of potential injuries. The Tundra, along with the Nissan Frontier, are the only pickups to not earn a "good" rating in either driver-side or passenger-side tests. IIHS noted that they are the oldest in the group, with the Tundra's basic structure dating to the 2007 model year and the Frontier's to the 2005 model year.